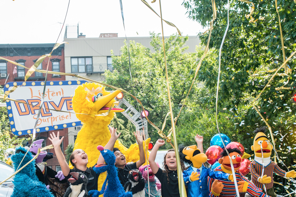 Chrysler recently announced that they are now a proud sponsor and supporter of Sesame Street, a commitment that includes supporting the show on PBS and original digital content. In addition to sponsoring the show on PBS, Chrysler is creating a multimedia campaign that will pair Sesame characters and the Chrysler Pacifica and Chrysler Pacifica Hybrid in ten co-branded videos for parents that launched on Monday, July 17, across the brand’s digital and social channels, including Facebook, Twitter and Instagram. The first four videos, which can be viewed now on Chrysler’s YouTube channel, take viewers on an unexpected ride as the Muppets play “Listen, Drive, Surprise!,” a new game show hosted by Guy Smiley.